Hitesh Steel is a highly appreciated name in the global market for exporting and wholesaling a wide assortment of best quality Monel 500 Fasteners. 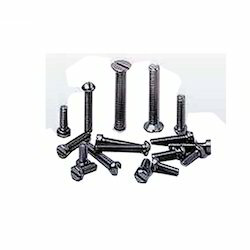 These fasteners are acclaimed in the market for their features such as dimensional accuracy and reasonable prices. The Monel 500 fasteners are used in various industrial operations. Industrial Screws: Pan Head Slotted Screws, Hexagon Head Screws and Cheese Head Slotted Screws, Countersunk Head Slotted Screws, Countersunk Raised Head Slotted Screws, Pan Phillipse Head Screws, Countersunk Phillipse Raised Head Screws. Industrial nuts: Hexagon nuts, hexagon coupling nuts, hexagon thin nuts, square nuts, hexagon castle nuts, self locking nut and hexagon domed cap nuts. Looking for Monel 500 Fasteners ?